The Dark Knight Rises will have a different visual aesthetic than Batman Begins and The Dark Knight. 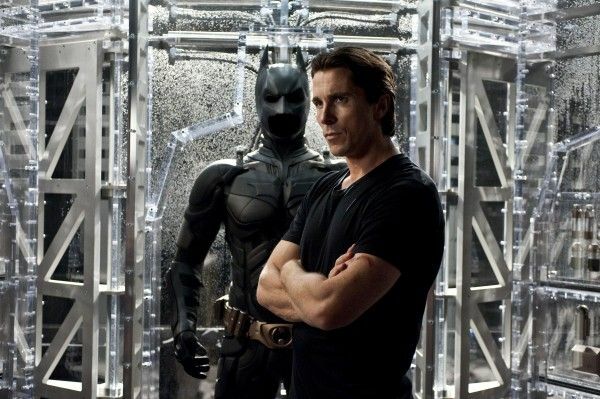 Christopher Nolan and David S. Goyer drew from comic book elements for the script, but ultimately their plan was to complete the stories that were started in Batman Begins and The Dark Knight. They decided to shoot in Pittsburgh because they had shot “every inch” of Chicago for The Dark Knight and didn’t want to repeat themselves. They wanted The Dark Knight Rises to feel like something no one’s seen before. 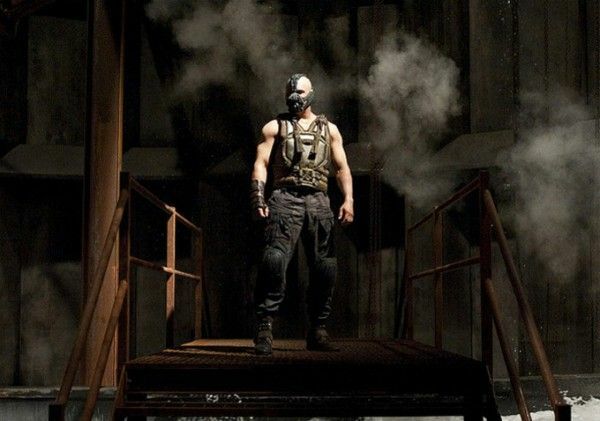 Bane makes his plans known to the public during the professional football game that he interrupts. They didn’t want to revisit the Joker character as a villain, so they decided on Bane because he represents a physical challenge to Batman. They shot in India, England, Scotland, Pittsburgh, L.A., and New York. They shot a lot in IMAX. Sometimes they shot in both IMAX and 35mm, and other times they just exclusively used 35mm. As usual, I’m offering you two ways to get the interview: you can either click here for the audio, or the full transcript is below. 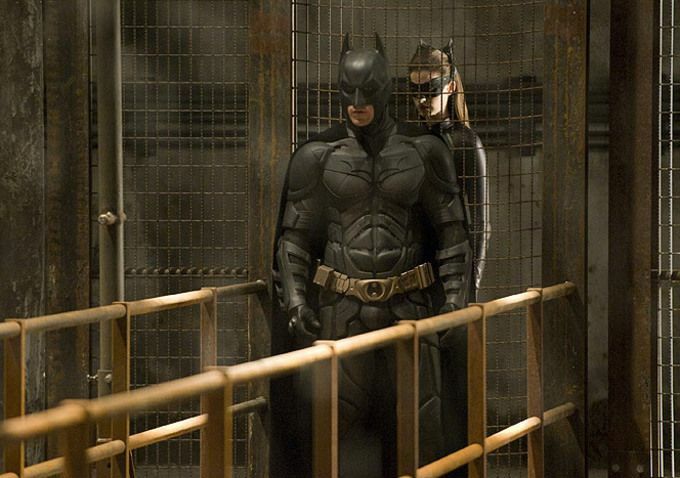 The Dark Knight Rises opens July 20. Emma Thomas: Basically, this scene is in a football stadium and we’ve got the Gotham Rogues playing the Rapid City Monuments. It’s really fun for us, shooting in Pittsburgh, because we had the Pittsburgh Steelers here this morning; they’re playing some of the Gotham Rogues. What happens in this scene is, and this is the total top line rather than giving you the whole thing…basically, Bane (Tom Hardy) comes and subverts it and, as you probably know, he’s one of our villains. He takes this moment to tell Gotham what his plan for them is. Is that to do with all the craters? Thomas: You’ll see that. There’s going to be quite a lot of explosions during the game. You’ll see all that later on, hopefully. Does Ben Roethlisberger get blown up? Thomas: No, we’re not going to be blowing him up, although he was he was here this morning. It’s a shame you got stuck in traffic. We just shot all the Steelers for the national anthem moment and he was here. So is this Bane’s introduction in the movie? Thomas: No, it’s not his introduction. This is the moment, though, where he makes his plans known. What can you tell us about what Bane’s agenda is and how close it is to the comic book roots? 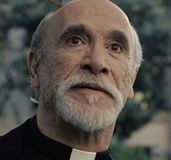 He was a lifelong prisoner and had a Spanish accent in the comics. How much of that is intact in the movie? Thomas: Without saying too much, I think we’ve retained what works for this universe and for our world. He’s definitely recognizable. But then there are some things that we’ve changed, because I think they wouldn’t have fit into Chris Nolan’s version of the world. Are you surprised at the level of interest around the world in your production? This is, in my opinion, the most set photos that have ever hit the net. Were you prepared for this or did it hit you blindside? Thomas: We’ve definitely been surprised by it. 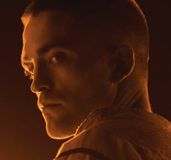 It’s interesting because every film that we make…certainly with this film because of the property and because of the success of The Dark Knight, there’s definitely a whole different level of interest based on the tie with that. But also, every time we make a film, every two years, what’s interesting to me and what I find fascinating, is that technology has changed. Twitter wasn’t a big thing even on Inception, it certainly wasn’t on The Dark Knight. It just seems to me that there’s so much more…people communicate in a whole different way now. It’s partly a function of what we’re shooting. On The Dark Knight, for example, we were shooting mostly night shoots in the Loop in Chicago, so there was no one around to take photos. There were a few die-hards that would come down to the set and be there for everything, but this is slightly different. We’re shooting in the middle of the day and in the middle of Pittsburgh. There are lots of different reasons why there’s a lot more interest, but one of the most interesting things to me is the way that technology is different. Where, on The Dark Knight, if someone had taken a set photo, it might end up online maybe the next day or maybe a couple days later. But now, I’m literally looking on the computer and, a half an hour after we’ve shot something, it’s everywhere! It’s crazy! And I think it’s a bummer, personally. I love that people are interested and excited, but I’d prefer people waited for the movie. 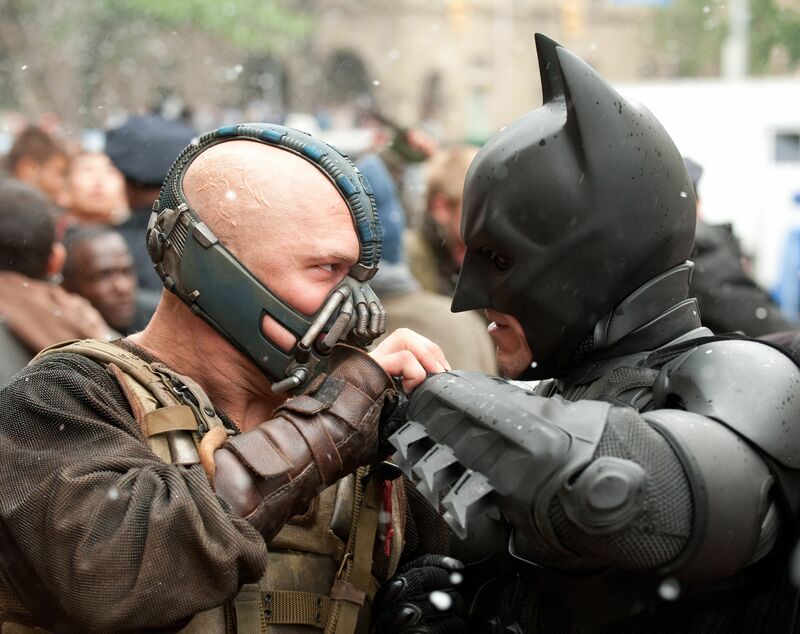 What about the choice of Bane for this movie, which is obviously very different from the Joker. The Joker was very intelligent, very methodical…you’d imagine Bane to be all brawn. Was it deliberate to go that rout with this movie, to be more action based? Thomas: That’s something that Chris can speak to a little bit more than me, and probably Tom, too. I think that’s one of the interesting things about Bane as a choice. We were obviously never going to revisit the Joker and you don’t want to be trying to chase that. So it’s fun to have a very different sort of villain in this and a different sort of challenge for Batman to meet, much more physical. It’s almost a more even match in some ways, you know, in a physical sense. You just don’t want to do the same thing again. Thomas: We haven’t, it’s true. As we were just saying, there’s so little that we can control about what goes out there at this point. It’s actually quite nice to not give everything away. Those pictures went out yesterday, didn’t they? The first pictures of Anne (Hathaway) as Selina Kyle? Did you feel you had to release those pictures after some of the photos had been taken on Twitter, just to have more of an official image? Thomas: We knew that we were going to be shooting outside on those steps and we knew it wasn’t going to be Anne, because it’s her stunt double who does that. We weren’t going to send Anne down on that part. We’re not often reactive, but we were trying to be proactive there. We didn’t want the first still out there of Anne…of the character, to be the stunt person; we wanted it to be Anne herself. Can you talk about any of the comic book storylines that may have influenced this? 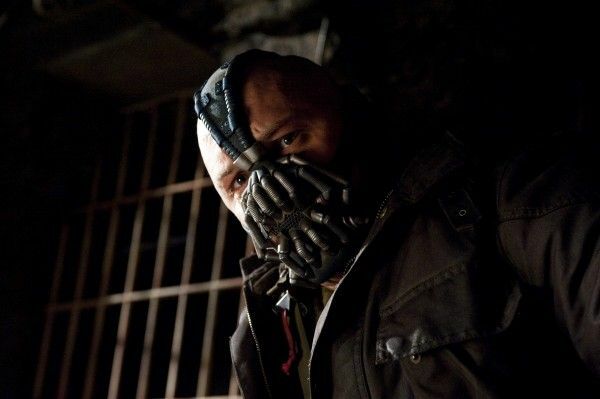 Clearly, when you bring up Bane, everyone thinks of the Knightfall storyline. Are you actually culling from existing storylines for the basis of the film? Thomas: Not being one of the writers, it’s difficult for me to talk about that sort of inspiration. I think that Chris and David Goyer are very mindful. It’s great for them to have that massive treasure chest, really, of the comic book storylines to draw from. Once again, as I was saying in terms of how things fit into our world, ultimately what they’re doing is completing the stories that were started in Batman Begins and The Dark Knight. They’re drawing from comic book elements, undoubtedly. I can’t speak to which specific elements because that’s their thing. But it’s a mixture of both. One of the things that people have remarked on is that you’re shooting so much in the daytime. Is Chris going for a different visual aesthetic on this one? Thomas: It’s definitely a different aesthetic. Once again, we didn’t want to just be repeating the same old thing. I don’t think anyone would want to see just the same old thing and it certainly wouldn’t be any fun for us to tell the same old story. Visually, I think the same thing applies to that. 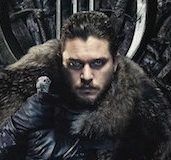 It’s meant to be winter in Gotham, so that right there is going to lend a whole different look to the film. So far, we have shot rather more in the daylight than we did in The Dark Knight, but we’ve got a lot of nights coming our way, too. What are the pros and cons of being here in Pittsburgh instead of Chicago where you shot the first two movies? Thomas: It’s great to be in Pittsburgh. We’re having a really great time here. One of the biggest reasons we came here was that Chicago…we had a fantastic time there and we loved it, but we literally have shot every inch of that city. As I said, we don’t want to be retreading old territory, whether that be visually or in terms of the storyline. We want this to be a stand-alone movie that just doesn’t feel like something anyone’s seen before. Gotham is meant to be a massive metropolis; it’s meant to be a huge city. I think we felt like if we went back to Chicago we would be limiting the scope and we just wanted to make it feel massive. There are locations in India, too? Thomas: Yeah, we shot a small piece in India. We’ve been all over the place. We’ve done India, England, Scotland, here, and going to L.A. next, and then New York. What’s the final percentage of the film shot in IMAX? Are you using the new, small IMAX prototype cameras? Thomas: We’re still using the big ones, which is great. Obviously there are real limitations in terms of dialogue scenes and heavy drama stuff, so we’ve shot some of that with both and some of it exclusively with 35mm. 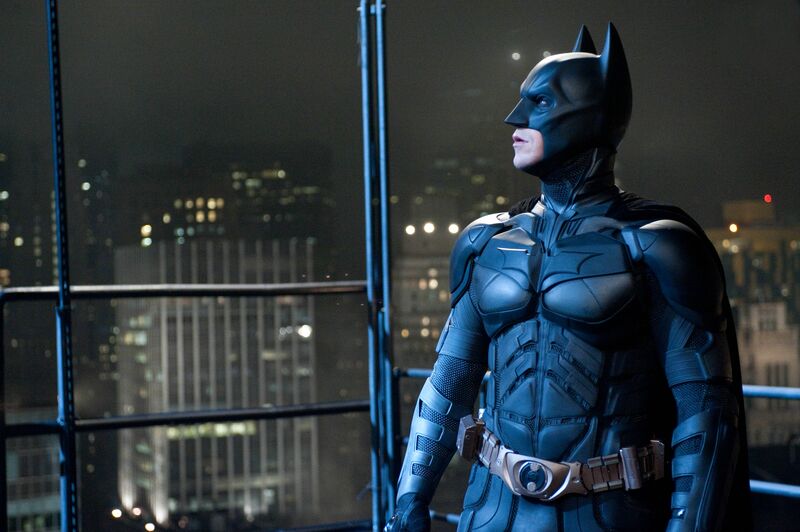 There’s no doubt there’ll be a lot more on IMAX than there was on The Dark Knight. One of the more interesting things about Bane’s character is that, beyond being a physical match for Batman, he might even be smarter than him. Is the intellectual component of Bane very much present in this movie or is it more physical? Thomas: I don’t want to sound like it’s all about brawn, because it’s not. He’s definitely a smart guy. We are definitely touching on that, there’s no doubt. I think that that’s why it’s an interesting match for Batman after the Joker, who was just purely about chaos and playing with people. Bane has a plan. Everything in this movie is epic, including the casting. People have remarked on just the sheer number of actors involved in this. What can you tell us about some of these other characters like Tom Conti and Matthew Modine and Alon Aboutboul and Christopher Judge, all those guys? Thomas: Once again, we feel very lucky to have such an amazing cast. Chris’s attempt has always been, beyond the big lead roles, to flesh out the world with believable characters. 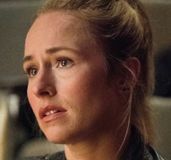 A big part of that is getting really amazing actors to play the parts.